[This lovely San Marcos is no longer being produced as of mid-2016. It was always meant to be a limited edition special project.] 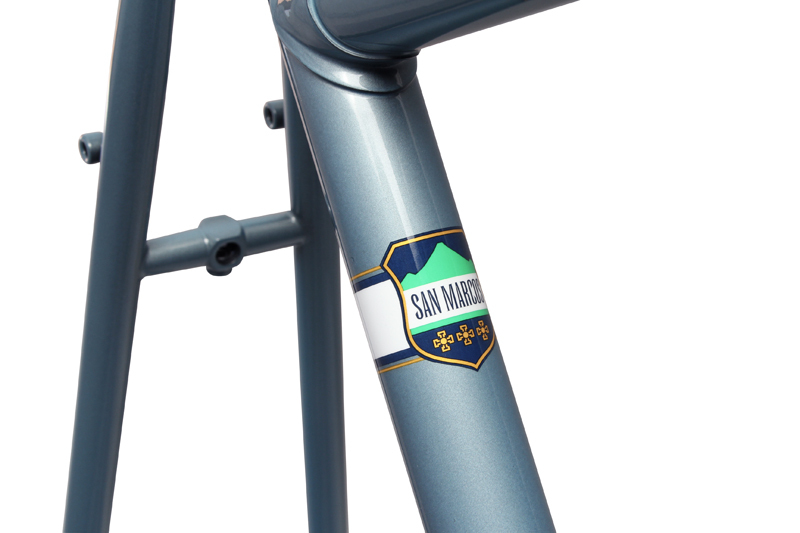 The San Marcos is a "sport touring" road frame designed by Grant Petersen of Rivendell. It is a fine ride on black top and smooth fire roads. While not designed for loaded touring, it can probably handle that type of duty even better than the Double Cross, which was Soma's go-to choice for touring before the Saga was designed. Fork includes mini rack braze-ons and fender eyelets. The 59 and 63cm have that Rivendell double top tube to restore the triangulation lost with the tall top tube. Why I should or should not have a San Marcos in my life? Give me specifications on the San Marcos not listed on the Info tab. Full Review: http://actcyclist.blogspot.com/2014/05/soma-san-marcos-in-depth-review.html "...So that's pretty much the build and some of my thoughts about it but what do I think about the finished product and the frame itself? After riding 4500 miles I can say I am completely in love with this bike 95% of the time. The other 5% of the time I wished the bike were a bit lighter. It's not really a heavy frame at about 6 lbs for the frame and fork, and I tried to select the lightest parts I could while still having all the features I wanted. Before I put the racks, kick stand and bag with gear on the bike it weighed 26 lbs. Once I added the racks, etc. the bike gained 5 lbs. To loosely quote Grant Peterson,"it's hard to build a useful bike for less than 30 lbs". The five percent of the time when I wish it were lighter I'm usually carrying some weight and/or going up hill or against the wind. Lets get back to the 95% of the time when I am completely smitten with this bike. First thing is the fit, it's everything I hoped it would be. When I first started riding this bike It was like it was made for me. The Cannondale fit me pretty well once I had the stem extender installed, so that was my starting point when I started plugging dimensions into bike CAD. The San Marcos is 2 cm longer in the top tube, which I was a bit worried about, so I used a shorter 50 cm stem. Once I started riding the bike I was happy to have a little extra room to stretch out. I am using a Nitto Technomic stem with about 4 inches of rise. Let me first say I love the threaded stem with it's ease of height adjustment. Also I personally prefer the aesthetic of a threaded stem. I must also compliment the geometry/design that Grant Peterson used on this bike. With a longish head tube set at 71 degrees, the higher you raise the stem the more it moves back towards you, effectively shortening the reach. 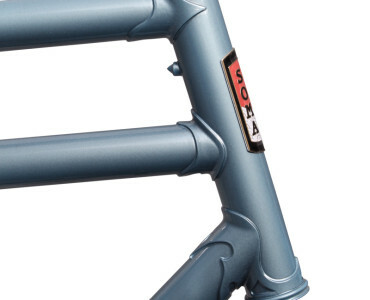 I also love the slacker seat tube angle of 71.5 degrees. That is an angle that is extremely hard to come by in a 51 cm frame, the typical angle is 74-75 degrees. My knees appreciate the slacker angle and I doubt that I would be able to use a leather saddle with their usually shorter seat rails if the seat tube angle was any steeper. The ride is sublime. It rides like a Cadillac, smooooooth. I'm sure it must be the combination of the Tange Prestige steel and the supple 650b tires. On the road the ideal tire pressure for me is 60-55 psi in the rear and 40-35 psi in the front. Being a 51 cm bike I'm sure it is stouter than it needs be since a small diamond frame is inherently strong. On the other hand I have no worries that the tubes will dent easily and I have full confidence it can handle any load I pile onto it. A Connecticut Cyclist, City, Conn.
I have had a Soma San Marcos for about 10 days. My other main bike is a mid 90s lugged steel Serotta Colorado CSI, which is a racing frame that I have fitted as far as possible for a more relaxed ride. 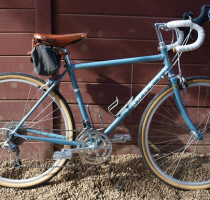 I had initially emailed Rivendell asking about the Sam Hillborne, San Marcos and Betty Foy (I am a guy BTW) and indicated that I was interested in a relaxed geometry sportive bike with drop handlebars. They gently guided me towards the San Marcos over the Sam Hillborne, and I am glad they did. I am 5 ft 8 1/2 inches with an 84 cm PBH. 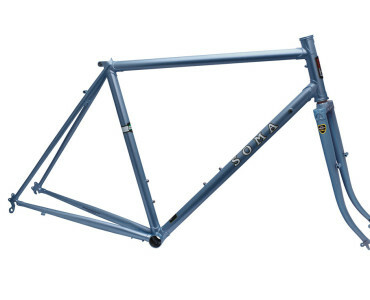 I am riding a Soma San Marcos 54 cm frame. I initially had a real concern regarding the Soma San Marcos' generous top tube length. This concern arose because the fit data from a formal fitting on the Serotta suggested an ideal top tube was 53 cm with a head tube of 20 cm or more. This arises due to my preference for a really upright posture. I have a 50 mm reach on my Nitto Technomic stem with short reach, shallow drop handlebars on my Serotta (top tube 55 cm) to try to compensate, and ended up putting a 70 mm reach Nitto Technomic stem and a Nitto 177 "Noodle" handlebar on the Soma San Marcos which theoretically should make the reach several centimeters longer on the San Marcos compared to the Serotta. The San Marcos feels quite comfortable and I am quite happy with my reach despite the theoretical concerns. This bike can fit pretty wide tires. That makes it versatile.There is really no downside to a bike being able to accept wider tires. You can always use skinnier ones if you want. This is not a re badged cycle-cross frame and the geometry is quite different from a cross bike. For example it has a lower bottom bracket which makes the bike extremely stable. It is actually a fairly light bike There was no real effort to bring the weight down on this bike yet it is just over 22 pounds including the pedals. ... I've ridden bikes that climb better But I wonder how much of that is wheels. The Campagnolo Vento CX wheels are not the lightest though they are actually not that heavy. However, the bike climbs better than I expected and far better than many bikes I have ridden. This is a great bike. The bike handles predictably, can be built up fairly light and is very comfortable. That said if I had to do it again I think I might have purchased a slightly sportier frame if I could find one that accepts the 28 to 32 mm tires. The problem with this bike is that I am not sure that it really knows what it is. It can do a lot of things pretty well but doesn't really do any of them as well as a bike that is focused on one type of riding. I kind of wish it leaned a little more toward a touring bike or sporty bike. "Moderation in all things" may be a good moral philosophy but I am not sure it applies to bicycles. 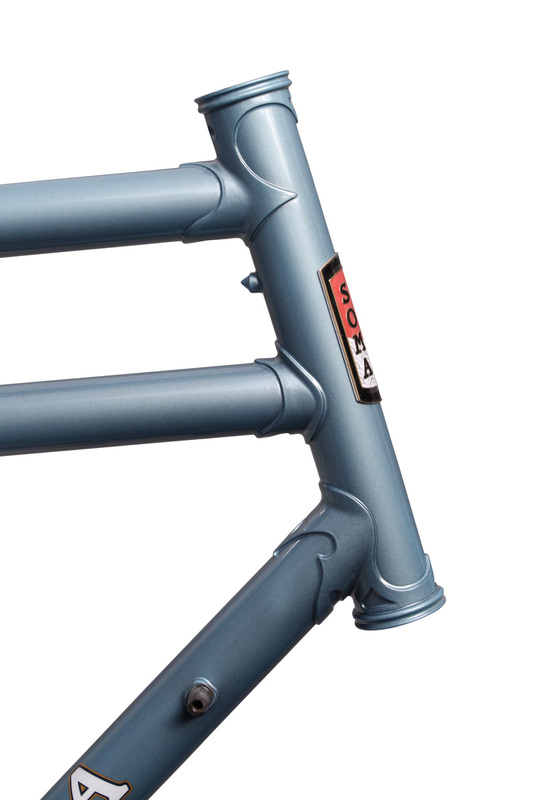 This is a frame that is OK for someone like me that has other bikes for specific purposes but might be an issue for someone with only one bike. It is racy but not nearly racy enough for the fast guys. It can carry things but not very much and isn't really suited for a long or self contained tour. It is light but still heavier than a weight-weenie would approve of. It would make a good commuter unless you had to carry lots of stuff or had to lock it outside. Potential buyers should think hard before buying one. If you need a touring bike or heavy duty commuter get a Sam Hillborne, Atlantis, Surly LHT, the Soma touring bike or VO Polivalent. If you want the racy steel get a StanYan or Rivendell Roadeo. There have been those who have criticized this frame stating that it doesn't know what it is or that it isn't an excellent bike for any particular purpose, but I think that is precisely what I enjoy about it. It isn't a race bike, and no one is likely to use it for sprinting. It also isn't a touring bike because it's not equipped to handle the load needed for this type of travel (though it does have eyelets for racks as desired), but it can take a small amount of weight in front, back, or both and would likely do fine on a very lightly loaded or fully supported tour. ....The appreciation for this bike (at least to me) comes with its adaptability and ability to take a rider comfortably over distance. If I were looking for a race bike or one to keep up with speedy club rides, this would likely not be the choice, but since most of my riding is done solo and I can push (or not) as much as I choose, why wouldn't I want something that fits well and is comfortable? I’ve been a Soma Fabrications owner for a few years—I have a Double Cross DC that has thousands of commuting miles on it—so I was eager to ride something new from a company that specializes in versatile, tough, and long-lasting frames and accessories. 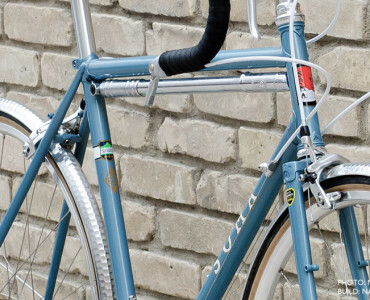 This bike is Soma’s love child with Rivendell, meaning it was designed for Soma as a “sport touring bike” by Rivendell’s Grant Petersen, using Rivendell lugs, geometry, and design details. The San Marcos is “the bike any road rider who doesn’t race but rides mainly on the road ought to be riding,” according to Petersen. So what are these design details? Well, it’s mainly about handlebar height and retro geometry to increase comfort. The concept is simple and time-tested: raise the handlebars to get weight off your hands, crane your neck less, and relieve stress on your lower back. 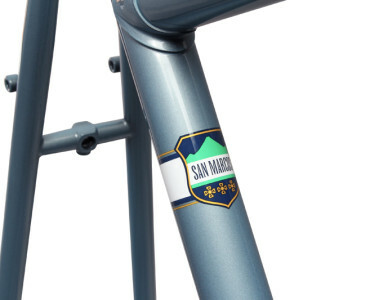 The San Marcos’ top tube slopes up about 6o, raising the stem’s exit point from the head tube. The bike’s 1-inch threaded fork uses a quill stem that you can easily raise or lower to get the perfect height. In addition to this main point of Rivendell geometry, you also get some bonuses to versatility that are on par with other Soma models. On the functional side, the bike will accommodate up to a 37mm-wide tire, or 32mm with fenders. The frame sports a pump peg on the head tube and two sets of water-bottle bosses. 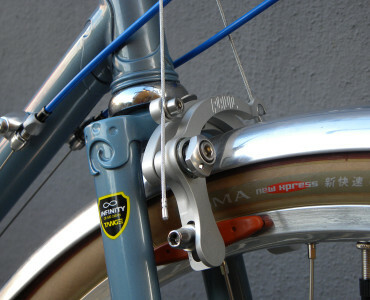 There are two sets of eyelets in the back for a rack and fenders, but only one set on the fork, meaning no front rack. Soma says light loads are fine, but this isn’t meant as a heavy touring bike. 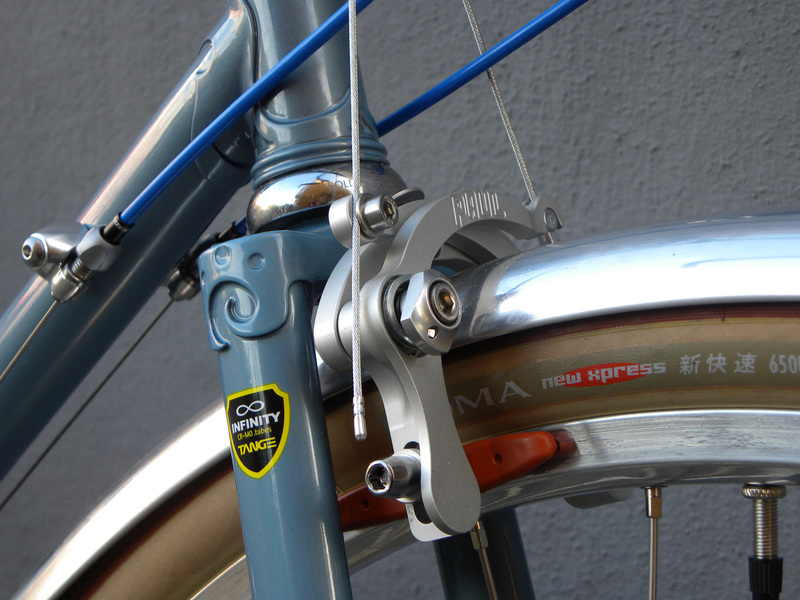 The San Marcos uses the same steel lugs, bottom bracket shell, and fork crown that other Rivendell bikes do. 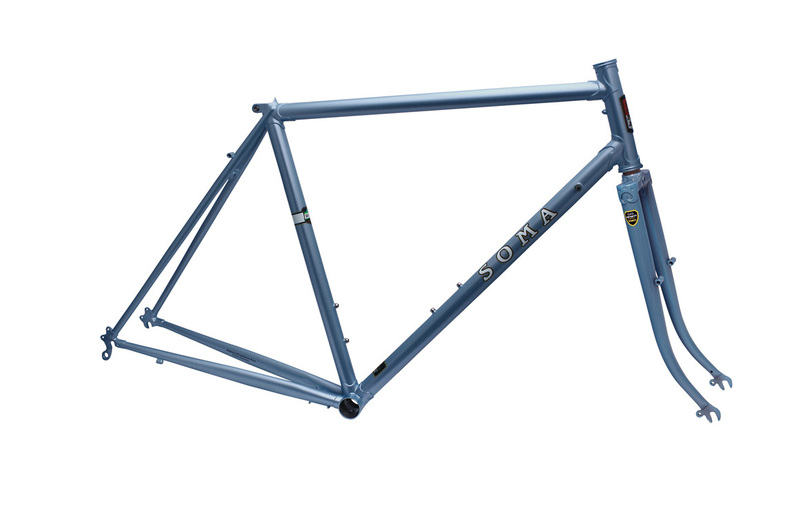 The frame is made of high-quality Tange Prestige heat-treated, chromoly steel tubes, same as other Soma bikes. 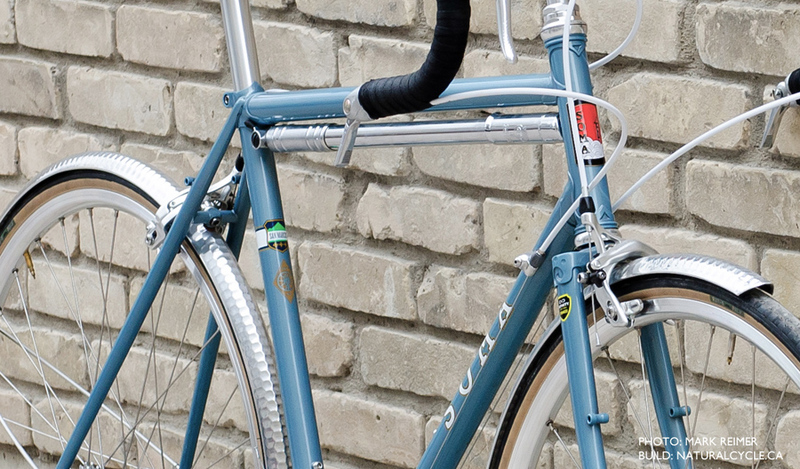 What you don’t get are the even higher-end steel and the fancier two-tone paint job of more expensive Rivendell bikes. 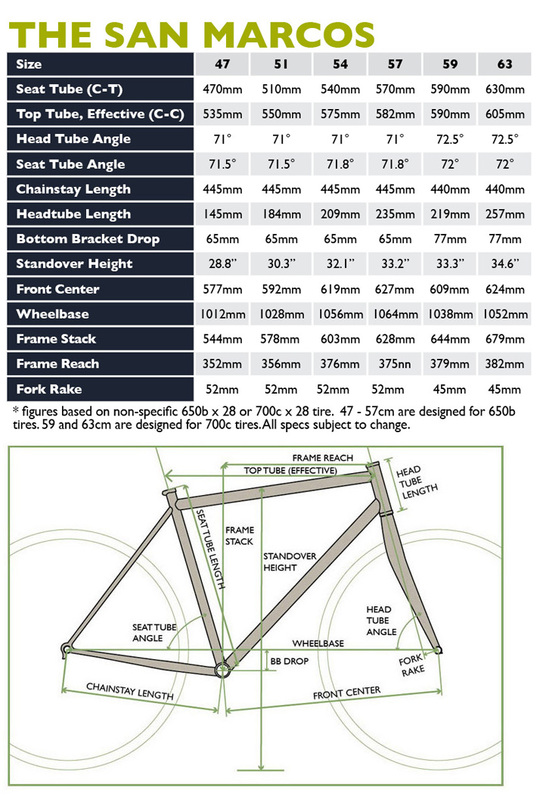 The two largest sizes have a double top tube. Since Petersen prefers the classic look of small-diameter tubes and lugs, an extra top tube was added on the 59cm and 63cm frames to maintain the same level of triangulation and stiffness as the smaller sizes, especially in the front end. This design has become one of his trademarks. I believe bikes have personalities and those personalities are part of the buying decision. Jim Porter of Merry Sales (Soma’s distributor) says their relationship with Rivendell is like the relationship of Elvis to blues or gospel music. Taking his analogy further: if Rivendell is gospel, then Soma is Elvis being played in an old Cadillac. The San Marcos gets you where you want to go in comfort and style, but it’s not going to be the most racy thing to ride. My test bike was built with 32mm-wide tires and had an incredibly smooth ride, but no tail fins (they aren’t very functional). Rough roads and smooth gravel were less of an issue for sure, as long as you’re not in a hurry. Riding tall with those high handlebars meant the compact drops are probably at the height of most riders’ brake hoods. This provided several comfortable hand positions. The frame is both tall (in the top tube) and low (in the bottom bracket), which helped make for a very stable ride that carved turns gracefully. The extra tube certainly seemed to help with front-end stiffness, as intended. I’m not that light, or that slow, but I never detected any lateral flex standing on steep climbs, or front shimmying on fast descents. For those of us used to more modern geometry, the extra top tube looks like overkill. I wouldn’t be surprised to see it on a bike intended for heavy touring. But it’s actually a retro solution to preserve frame integrity. The San Marcos is definitely a comfort road bike that many people could get into as a versatile commuter, or a bike able to cart a light load, or just for getting out on long rides. In terms of goals and execution, I think Soma Fabrications has a winner. The San Marcos looks good and does everything it was meant to. 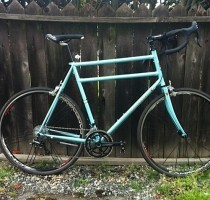 It’s comfortable and versatile, but an inexpensive Rivendell is an expensive Soma. If you’re down with the retro styling and geometry, I’m certain this would provide years of comfortable service and enjoyment.